Last weekend, 28th-29th October, was Killer Weekend at Brown’s Courtrooms in London. After the success of last years’ event arranged by the Killer Women, this weekend was geared towards budding writers who want to be published. Included were wonderful panels featuring great writers from the world of crime fiction including Ben Aaronovitch, Erin Kelly, Julia Crouch, Mel McGrath and Mark Billingham. 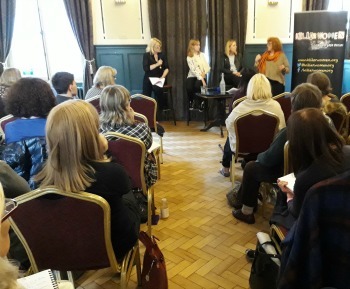 All were talking about a variety of different aspects encompassing a wide spectrum of the crime field from getting published, to genre splicing, to the next big thing and finally, pitching your novel to a panel of leading agents in the crime field. Alongside these panels were some marvellous workshops which really captured my imagination and made me think of ways to write in an entirely different way. It certainly got my creative juices running and the fire in my belly to get started writing. Workshops included ‘Making a Murderer’ with crime writer, Laura Wilson and the superb ‘Creating Suspense’ with N.J. Cooper. their own book in their hands! I look forward to seeing what the Killer Women do next year. Whatever it is, I will be there! anthology of short stories written by women who are writing at the top of their game. Join up for all news and reviews from the Killer Women website. Jørn Lier Horst: Why Do We Read Crime? Remembering the Battle of Passchendaele. An Appreciation of Patricia Highsmith. A Dark-Adapted Eye: 30th Anniversary Ed. Wonder Woman and her Greek heritage. Cover Reveal for new Dreda Say Mitchell. Hark! Hark! The Dog does bark! Susan Hill - Q&A with the author. Silver Anniversary for Dr Hannibal Lecter! 50th Anniversary of P.D. James' 'Cover Her Face'. Batman - The Great Detective? Morse Creator, Colin Dexter Honoured at Harrogate. P. D. James Event at Foyles, London.